Sometimes before we can believe in hope, we have to first have to believe that we, the unique individuals we each are, are valuable for simply being a life … a person. One of the best ways I finally discovered to truly believe in my own worth … not as a person more important than others, but certainly no longer less important … was connecting the dots with the idea, what I named the Respect Principle, that every person should know by their own experience, they are valued … respected … because when a person does not know this a series of events turn into experiences with the potential to send people on a downward spiral, as it did me for several years. To compensate for a very low Respect Level, for myself and as a result for others, my ego, supported by defensiveness and at times, indignation, prevented me seeing how I was repeating the pattern of acting with a low Respect Level towards myself and others … sabotaging my own life and success. Since developing the Connecting the Dots … with The Respect Principle concept, a deep internal shift occurred in me, which I am extremely grateful for; however, the shift did not result in my thoughts and behavior mirroring my new beliefs right away. Just the other day I was challenged by someone. At first, the old responses arose. First fear, then indignation and finally the realization that because of my fear, I had tried to control a situation that would have been better resolved respectfully to both parties if I had controlled my fear instead and acted accordingly. Fortunately, I can see things clearly because of my higher Respect Level and for the others involved and can apologize with the sincerity from the heart and not just the mouth. 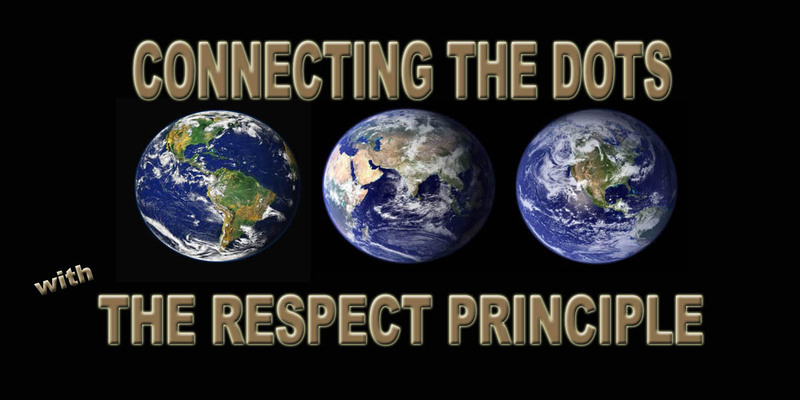 The concept of seeing the big picture, connecting the dots of humanity, through the lens of the Respect Principle is what has instilled new hope in my heart because of the possibilities. The simple idea of everyone being treated the same … as valuable … entitled to respect … just for being a person, whether I like, agree with or identify with them in some way is so inspiring my life is now dedicated to the goal of sharing the vision and experience with others. Now for some people, this evolution of raising one’s Respect Level may be enough once the results yield more positive versus negative results; however, I discovered I was still hungry for something more. As wonderful as life was becoming because I was increasingly being filled with the ability to value … respect myself and others, I realized I wanted more. And the more was love. Not the conditional kind many people experience, where people only “love” us when we do what they want, act like they want, etc., but the kind with no qualifiers or disclaimers. The kind of love I found only when I looked beyond the physical world to the spiritual world. For me, raised and broken by Catholicism’s teachings and people’s misunderstandings or ignorance of the Bible teachings, I had walked away from religion, believing in God, as well as believing in people or myself. Even when I tried to fill the voids created by the low Respect Level and conditional love, other religions and other philosophies still left me hungry and unsatisfied. With a high enough Respect Level, I realized I was empowered to choose what spiritual belief I wanted to explore. For me, the choice was to return to Christianity to discover if what I had been taught was the truth or some people’s interpretation. I wanted to be able to choose if I wanted to accept the Christian faith or if I needed to keep searching. Studying an amplified Bible on my own with the help of television teachers, for me, has resulted in my choice to be a Christian in words and actions because of the peace the faith provides, but what matters for all of us is when we are filled up with a high enough Respect Level to function and even thrive, we also eventually need a spiritual belief that inspires us to evolve higher as the spiritual beings we all are, even when, or especially when, the people around us do not. Each and every one of us is a unique being with our unique combination of gifts, talents, and abilities. Christianity also agrees by the teaching we each have our own unique race to run as a human being. Regardless of what you may think or believe now, I know from experience, and I hope you will discover for yourself, that respect does restore hope … and hope restores our sense of wonder as being spiritual beings living a human life. Kaitlin Ann Trepanier … The Respect Specialist, Humanitarian, Social Entrepreneur, Publisher, Author, Creative, Speaker, and Developer of core concept, The Respect Principle, and the global initiative, Respect for All. Stalled for a few years, the restarted company designed as a for-profit to meet the social need develops and delivers books, products, and services that educate, entertain, and inspire the positive changes needed for the vision of Respect for All. 1. UNCONDITIONAL LOVE … no other words for it except literally meaning you love and act out in love … without requiring or requesting someone to meet your conditions. 2. LOVE, also known as, devotedness, attachment, care for, delight in, hold dear, etc. 3. FORGIVE, also known as, cease to resent, excuse, condone, pardon, bear no malice, etc. 4. KIND, also known as, careful, tender, well-meaning, considerate, charitable, loving, etc. 5. PATIENT, also known as, forbearing, mild-tempered, composed, tranquil, unruffled, etc. 6. OPEN-MINDED, also known as, tolerant, fair-minded, intelligent, unprejudiced, etc. 7. GENEROUS, also known as, liberal, charitable, altruistic, unselfish, considerate, etc. 8. HELPFUL, also known as, valuable, co-operative, practical, pragmatic, usable, etc. 9. THOUGHTFUL, also known as, meditative, matured, contemplative, introspective, etc. 1o. RESPECTFUL, also known as, showing respect for, valuing, considerate, etc. Based on the The Respect Scale from the core book, Connecting the Dots … with The Respect Principle. See books, products, and services. My deepest condolences to anyone whose loved one took their own life. I am also reaching out because my own experiences certainly invoked the desire more than once to leave this plane, raising my own Respect Level empowered me to ask for the help I needed when I needed it … and my work with the Connecting the Dots … with The Respect Principle … the books and more God put in my heart to create were developed to counter any reason people do harm to themselves or others. Seriously, feel free to contact me through Facebook or through http://www.therespectprinciple.com contact form if you or someone you know is struggling. PREJUDICE … also known as partiality, prejudgment, narrow-mindedness, etc. GOSSIP … also known as petty talk, meddling, malicious talk, rumor, hearsay, etc. SELFISH … also known as self-centred, narrow-minded, egotistical, prejudiced, etc. UNKIND … also known as malignant, inhuman, inhumane, hateful, savage, etc. JEALOUS … also known as envious, possessive, resentful, begrudging, etc. MEAN … also known as small-minded, shameless, vicious, contemptible, etc. CRUEL … also known as vicious, spiteful, sadistic, vengeful, tyrannical, etc. VINDICTIVE … also known as revengeful, retaliatory, unforgiving, ruthless, etc. ABUSE … also known as insult, injure, hurt, harm, damage, impair, mistreat, etc. VIOLENT … also known as coercive, brutality, savagery, deliberate, murderous, etc.